CC Auto Repair is a locally owned shop that relies on two old school values - honesty and integrity. We opened our auto repair business in West Mansfield, Ohio with YOU in mind! We wanted to open an auto repair shop in West Mansfield, Ohio where you would feel confident about letting us repair your vehicle. At CC Auto Repair, we strive to make sure that regardless of the repair, that you will feel informed and involved in the auto repair process. 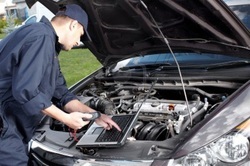 At CC Auto Repair we employ only highly qualified auto mechanics. We are much more than an oil change service. We offer a complete line of auto repair services in West Mansfield, Ohio including tune-ups, brake work, suspension work, timing belt replacement, and much more! We are fully equipped to perform scheduled maintenance on most makes of foreign and domestic automobile and offer full diagnostic reports on most models. We diagnose small intake and vacuum leaks that like to steal your gas mileage, and can even diagnose those dreaded check engine lights, ABS lights and SRS lights that like to clutter up your dash with their incessant presence! Hate going to auto dealers because of their inflated rates? If so, you will LOVE your experience at CC Auto Repair. We are a small business with low overhead and pass those savings onto you! Our fully equipped auto repair shop relies mostly on referrals for business. We believe that referred customers make our best customers! We strive to do such an excellent job for YOU that YOU cannot help but tell YOUR friends about YOUR experience.